As Geoff Ogilvy teed off at Kapalua yesterday, reminders of the PGA Tour's new points race -- the FedExCup -- loomed nearby. KAPALUA, Maui » If you're confused about how this FedExCup playoff system and its $10 million grand prize is going to work this year on the PGA Tour, you're not alone. Many of the players are wondering the same thing. 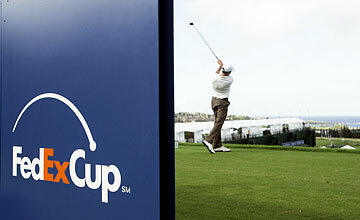 As the $5.5 million Mercedes-Benz Championship begins the 2007 tour season this morning with K.J. Choi and Adam Scott teeing it up first, a new era in professional golf begins, with players trying to figure out how this new format affects their lives. » Official events played during the regular season will distribute 25,000 points each week. » The Masters, Players Championship, British Open, U.S. Open and the PGA Championship will award 27,500 points each week. » The three World Golf Championship events will award 26,250 points each week. » And the additional events played opposite other tournaments will award 12,500 points each week. These 36 regular-season events decide the seeding for the three weeks of playoffs that begin Aug. 23 with the Barclays in Westchester, N.Y. The top 144 seeded players compete there, with the top 120 advancing to the Deutsche Bank in Boston the following week. It will then be pared down to 70 for the BMW Championship in Chicago, with the top 30 advancing to the Tour Championship in Atlanta. During the three weeks of playoffs, golfers will play for 50,000 points each week. But the golfer who wins the Tour Championship won't necessarily capture the $10 million first prize that is actually a deferred payment you can't cash in until you retire. "I don't think anyone knows how it's going to shake out," U.S. Open champion Geoff Ogilvy said. "Its going to build momentum during the year, and I think people will get really excited about it by the end of the year, so it will be a pretty big deal." Scheduling is the most difficult part of the new format. Golfers will be asked to play at least 25 PGA Tour events in eight and a half months, rather than 10. As it gets closer to the playoffs, it's possible golfers will play six events in seven weeks, including Tiger Woods, who rarely plays more than 20 tour events in a single season. "Most guys are a bit scared, six tournaments in seven weeks, to be honest with you," Ogilvy said. "No one has ever had to do that. Everyone is going to want to play Akron, you're going to want to play the PGA. Guys who want to improve their position will play Greensboro (the last regular-season tournament before the playoffs), and you have four in a row after that if you're playing well. "That's the only thing everyone is talking about. That $10 million carrot at the end, that's a pretty big deal. That's a lot of money for anybody." Including Woods, who is intrigued by this new format that's similar to the one used in NASCAR. Opting out of the Mercedes at the last moment, Woods won't begin his season until the Buick Invitational in San Diego in three weeks. Because of his father's poor health last year, Woods played in only 15 tour events. That's likely to increase dramatically in 2007. "It's an exciting time for golf," Woods said. "It's certainly going to be more exciting for everyone, not just us as competitors who will be bucking heads against the best more often, but also for the fans. The fans are really going to enjoy it, whether they are there in person or watching on TV. And all the sponsors are certainly going to enjoy the event more with a deeper and better field week to week. Its a no-brainer. We're doing the right thing." Three-time defending Mercedes champion Stuart Appleby doesn't believe anything will change on tour until it gets close to the playoffs. At that point, everything is stepped up a notch or two. "There will be some discussion, but I think the real crux of where the Cup is going to come is the last five weeks of the year when people are trying to make a move and extra pressure will be on. Otherwise, it's just a horse race. Get our position and get going. We're all going to be trying from every tournament. "There's none of this 'I'll try at the end of the year and make my run.' We'll be going as solid as we can. The schedule is more condensed. We don't know quite how, sort of how do we position (ourselves), do I play that event now because I traditionally have or now that doesn't fit as well because I need to make a run through here. A lot of guys are looking at the schedule more intently." World No. 2 Jim Furyk agrees with that assessment, but also believes there's an air of uncertainly as to how to schedule tournaments and how to take time off to remain fresh for the big push in August and September. "Obviously, we have a new format and I think getting used to that will be interesting," Furyk said. "A lot of tournaments are in a different part of the season and so working the schedule is a little bit new. Now you're kind of condensing your schedule and you're squishing everything together. "I think you have to approach this season as if it were any other," Furyk said. "Because ultimately, whether you're looking at the money list or the points list, what it really boils down to is you need to play well, and you need to focus on what's going to get you there and the process, rather than the end result." There's also life after the Tour Championship is completed on Sept. 16. There will be seven more tour events played through the end of October that will help determine the top 125 money winners who automatically keep their tour cards. It's unlikely many of the top golfers will play this fall schedule, so you wonder how much interest these tournaments will generate, especially after rewarding a $10 million grand prize two months earlier. World No. 4 Adam Scott, who opted out of next week's Sony Open in Hawaii, summed up life after the Tour Championship in one word. Dean Wilson will hold an autograph session during the Sony Open in Hawaii Pro-Am event Wednesday at Waialae Country Club. The Kaneohe product will be available to sign autographs from 1 to 2:30 p.m. at the Toyota Hawaii booth. Photos will not be allowed due to restrictions on bringing cameras onto the course. Wilson, who earned his first PGA Tour victory at The International last August, is competing in the Mercedes-Benz Championship on Maui and will play in next week's Sony Open. KAUPULEHU-KONA, Hawaii » Ben Crenshaw, Raymond Floyd, Gary Player and Lanny Wadkins have accepted sponsor invitations to play in the season-opening MasterCard Championship, the tournament said yesterday. The addition of the foursome in the PGA Champions Tour event, including three members of the World Golf Hall of Fame, increases the winners-only field to 42. The Jan. 19-21 tournament at Hualalai Golf Course features winners of Champions Tour majors of the last five years and tour winners in the last two years.